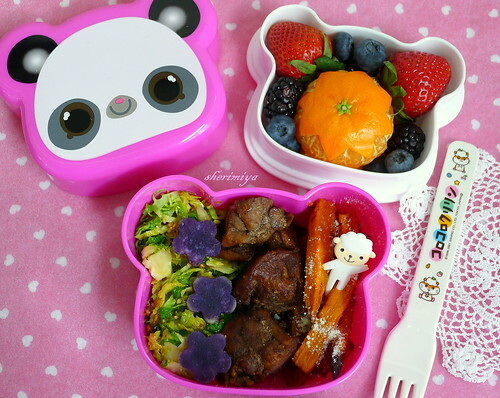 5-Spice Chicken Panda Bento, a photo by sherimiya ♥ on Flickr. Today's cute panda bento box holds shredded brussels sprouts (sauteed in olive oil, mirin, then tossed in sesame oil), steamed Okinawan sweet potato "flowers", some roasted 5-spice chicken, and sweet potato "fries" tossed with parmesan. The upper tier holds a mini cutie clementine, strawberries, blueberries and blackberries. The lid didn't close down over the clementine completely, and I didn't want to peel off the star-shaped cap, so I just smushed it down and secured it with the elastic belt. No worries! It does seem like a big bento for my preschooler, but actually this box is pretty tiny. Her appetite varies a lot every day, but I'm hoping the different flavors in this one will keep her interested. She's not big on greens so the brussels might come home. I'm not too concerned about it because both kids down a green drink daily. I'm so happy they really love it, and even consider it dessert after dinner. Woo! A pretty little lunch for a pretty little girl! Haha yes! The cuties are small enough that carving them is a cinch :D Thanks Nami!